I’ll be honest: I look forward to the after-Thanksgiving sales each year. I know, I know. That’s unexpected coming from someone who cares about sustainability. Still, it’s the truth. The reason is simple: I use those sales not only to get a lot of Christmas shopping done, but also to stock up on necessities while they are steeply discounted. This year, winter clothes for both my girls are on our needs list. And while I’m not above heading out into crowded stores to find some great deals, my absolute preference is just to shop online. The challenge? Finding the deals on what I want. Alas, CyberMonday.com has come to my rescue. 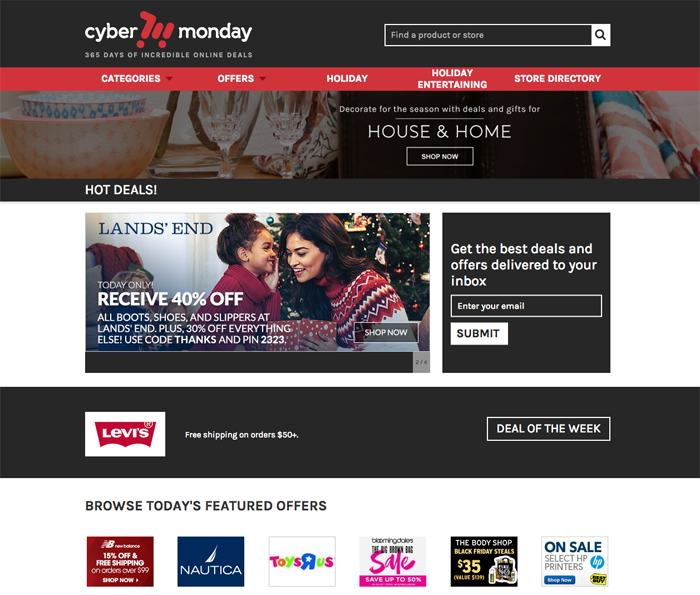 CyberMonday.com is a deal-seeker’s dream, no matter what you happen to be buying. It’s an awesome way to find deals, coupons and sales from all over the web all in one place. I started my search for winter clothes in the “Babies, Kids & Toys” category, then clicked “Apparel.” Voila! All the best deals from online retailers, including kids specialty stores and larger stores that also sell kids’ clothes. On one page, I could find free shipping, % off discounts and more. I don’t know about you, but I’d much rather spend this coming weekend at CyberMonday.com than fighting through the in-store crowds or refreshing my favorite sites. Check it out next time you’re looking for a great deal.